Beat the summer heat with a scoop of this 5-ingredient, Easy Irish Cream No-Churn Ice Cream! There is no tastier way to stay cool during the sultry dog days of summer than creamy homemade ice cream. Lucky for you, there is no fancy machine required to enjoy this Easy Irish Cream No-Churn Ice Cream recipe. In fact, it needs less than 5 minutes of hands on prep time before freezing. But the best part? 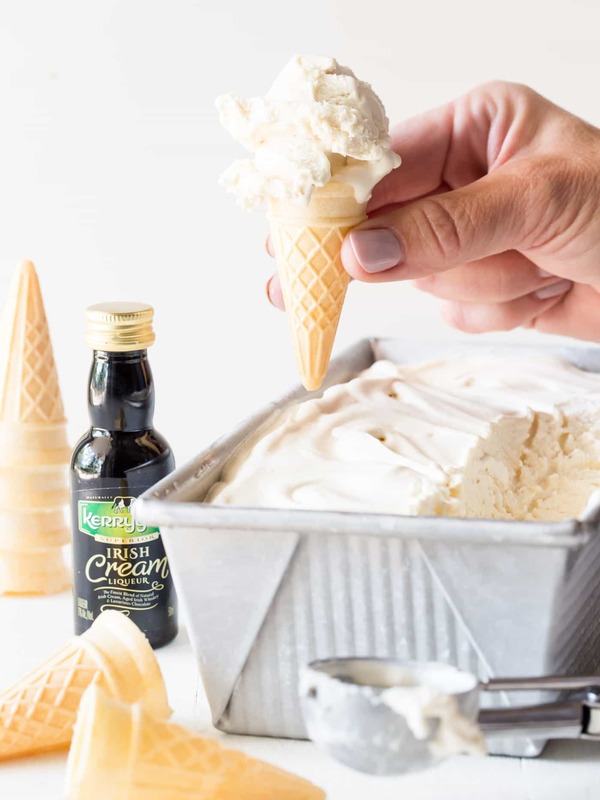 This no-churn ice cream is graced with indulgent Kerrygold Irish Cream Liqueur – a combination of natural Irish cream, real chocolate and oak-aged Irish whiskey – for the ultimate hot weather treat. The process for making our Easy Irish Cream No-Churn Ice Cream couldn’t be simpler. All you need is a handful of ingredients, a hand mixer and a loaf pan. Stir together the condensed milk, vanilla, salt and Kerrygold Irish Cream Liqueur in a large bowl. Whip the cream next and slowly fold it into the milk mixture. All that’s left is to pour the ice cream into the pan and freeze for at least 8 hours. No messy rock salt or expensive machine needed here! Tip: Pop your mixing bowl and beaters in the fridge 20 minutes before starting the ice cream to help the cream whip faster. 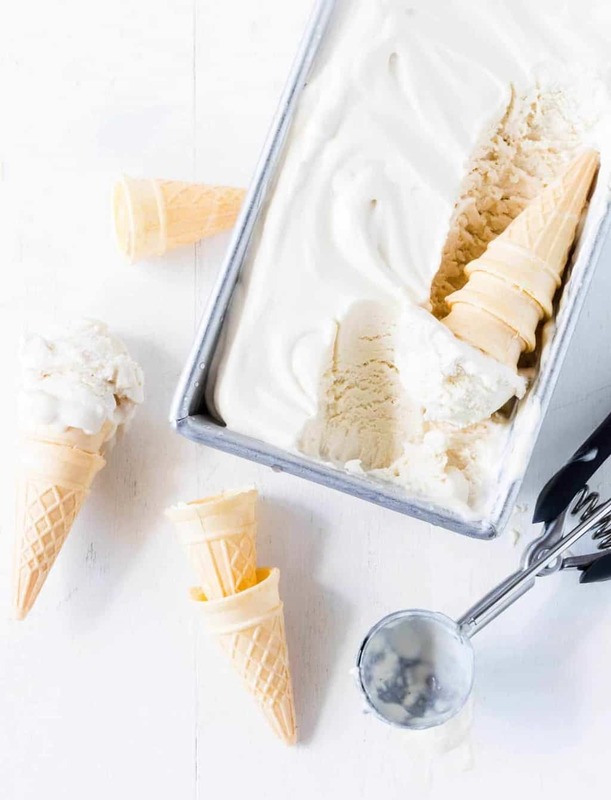 We love to serve small scoops of this Easy Irish Cream No-Churn Ice Cream on mini cones as they make novel and fun post-dinner treats when entertaining a crowd. If you’re feeling particularly indulgent, drizzle our decadent Irish Cream chocolate sauce over a bowl of this Irish Cream No-Churn Ice Cream for a double dose of Irish Cream flavor. Or just grab a spoon and eat it straight from the pan. No judgment here. Beat the summer heat with this easy Irish Cream No-Churn Ice Cream recipe. In a large bowl, stir together milk, vanilla, salt and Kerrygold Irish Cream Liqueur. Set aside. Place cream in a chilled mixing bowl and beat on medium-high speed for 2 minutes or until firm peaks form. Fold 1/3 of whipped cream into milk mixture to lighten it and then fold in the remaining cream until ice cream mixture is smooth. Pour ice cream into loaf pan and freeze for at least 8 hours. I did use a whisk to gently stir in some of the larger cream lumps that didn’t want to incorporate with my spatula. Just be careful not to overwhisk the mixture or you’ll lose the air from your whipped cream.